If you are owner of a company there is always lure for you to write your worker’s pay check straight from the account of a particular business. But workers of present age demand pay stubs. A pay stub is basically a paper document which is given to employees by employer. 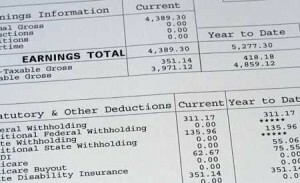 The reason for requesting this pay stub is to have proper information about their salary. With advancements in technology many companies have migrated to online pay stubs. Earlier employers used to mail or hand out paper pay stubs. Nowadays companies save money on paper and mailing expenses. With the help of online paycheck stubs you can easily calculate net pay of employee. Electronic employee management software has made it easier to view pay stubs. Pay stubs vary from company to company. They include information such as company name, employee name, address and employee social security number. It also includes important dates such as pay period start and end date. Some sections also include year to date column to list how much you were paid, how much was withheld or how much was deducted so far that year. Pay stubs online check gives information about gross pay which tells about a specific amount of earning that the employee made during a specific pay period. It also shows net pay which displays total earnings that employee take home after applying all the with holdings. It also tells about tax you have to pay to the government which fluctuates depending upon exemptions you enjoy. It also displays social security tax which is deducted for social security purpose. It also gives information about total number of working hours of employee. It makes your employees happy and your firm becomes successful. It has been proved that happy employees boost your profit. There are several sites online which offer varied templates for creating pay stubs. Each template is different from another taking care of employer’s need. Making of pay stub is much easier nowadays. Necessary steps taken include the employer registering for a free account with that particular website which provides a template for creating pay stubs. The employer is required to enter particular year which he wants to calculate each employer’s deductions by entering the person’s gross pay, his allowance and any other amount that need to be deducted and then clicking on “calculate” and he the result will be shown immediately. Job seekers are requested to show their pay stubs if they want to get a job. It acts as a kind of proof that the person has worked in so and so firm and earned that particular amount of salary as shown in pay stubs. Every employee wants security of payment from his employer. If the employee is paid in correct time, he will get more productive. So, the secret to keep the employees happy and productive is to take care of their payments. Instant pay stub helps to solve this purpose as it contains complete details about employee.